Your iPad can become a repository for all kinds of cool and useful information. With these iPad apps installed, you can have everything from the elements in the earth to the stars in the heavens right at your fingertips. Manual for the United States of America has all kinds of information about the USA and its government. You can read about the Declaration of Independence (including who signed it), and even get the U.S. Constitution in full — with the original Articles, all the Amendments, the signers (with bios), and scans of the original document. 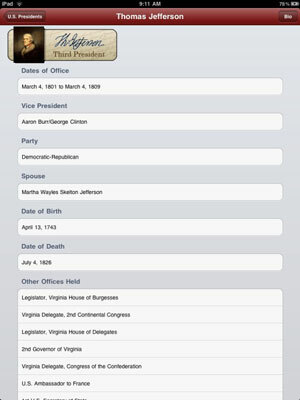 You can find the list of U.S. Presidents, in chronological order, and if you tap through on one of them, you get the dates they held office, birth and death dates, spouse’s name, a list of other offices held, any nicknames (whether enjoyed or hated), and a list of this president’s published works. The Elements — A Visual Exploration is a wonderful app that offers a way to explore the Periodic Table of the Elements. It features gorgeous photos and detailed information about each element, including background and historical details. In the full Periodic Table in this app, each element is represented by either a 3D, rotating image of the element, or a picture of the person credited with discovering the element. 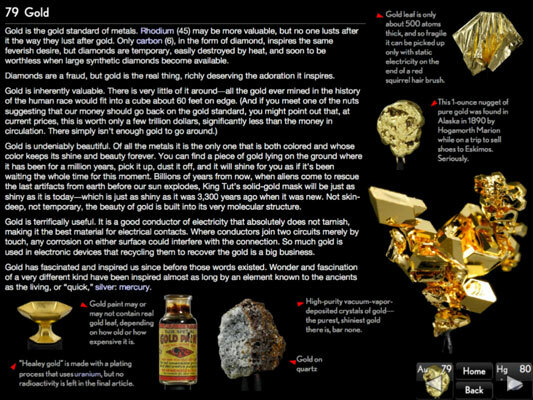 (Theoretical elements without final names have placeholder images while the scientific world hashes out what will be what.) You can go to pages with in-depth information on any of these elements. 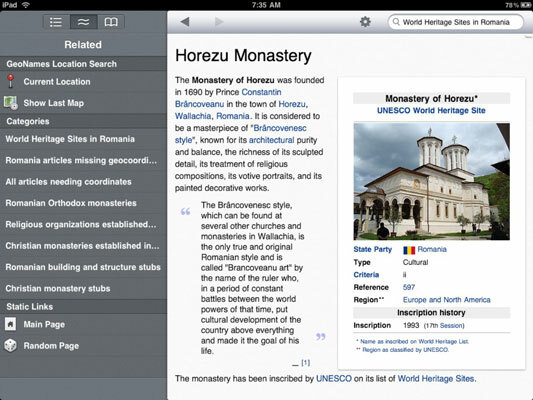 Wikipanion is a generalized app that allows you to browse all of Wikipedia. The search field allows you to search the contents of the current page (it’s like a Find search in a desktop browser), search Wiktionary, e-mail a link to the current page, or open that page in Safari — and you can change the font and font size, too. 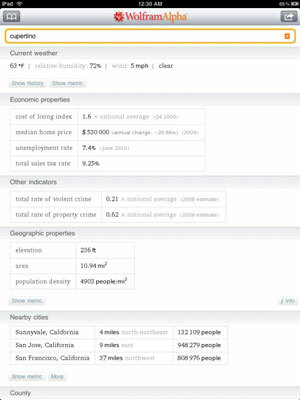 GeoNames lets you find your current location and any Wikipedia entries near that location, as well as Wikipedia entries that are near the article you currently have open. Other key features of the app include bookmarking favorite articles and downloading any images you come across to your photo library. WolframAlpha is probably the most awesome thing on the Internet you probably haven’t heard about yet. Often mistaken for a search engine, WolframAlpha is instead an . . . answer engine, for lack of a better term. With this service, you can find out a lot of facts about a lot of things, and you can also use it to solve advanced trigonometry and calculus problems. You can find information such as atomic weights, population figures, dates, calorie content, latitude and longitude coordinates, heights, depths, market caps and other stock information, employee counts, population figures, crossword clues for individual words, Scrabble-score values (seriously), etymology information, weather info, tax rates, and on and on and on. Math Ref is basically a repository of more than 1,400 “formulas, figures, tips and examples” for math, physics, chemistry, and more. Broken down into 18 categories, the app allows you to bookmark favorites and search for any terms you want defined. 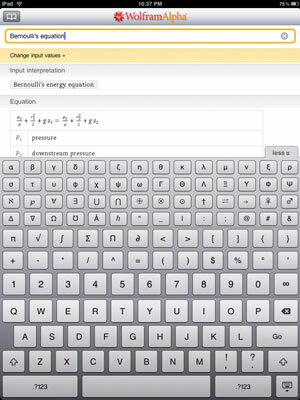 Now, if you can only get your teacher to let you use your iPad during that test! This app offers the power of having some 250,000 definitions (words and phrases) on your iPad. It has an advantage over a print dictionary, too: You can do wildcard searches. You can use question marks (?) to substitute for individual letters or an asterisk (*) to substitute for an unknown number of letters. You can also search for similar words (though there’s no thesaurus), and you can make in-app purchases to get additional dictionaries in English, French, and Spanish. Moon Atlas is a great app with which to study the Moon. The app offers a view of the visible side of the Moon, with major features labeled. The farther you zoom in, the more labels appear, allowing you to get information about craters that are quite small (on a planetary scale). You’ll even find the locations of man-made lunar landers and other equipment! Plus, you can use the app to see the moon as it looks from anywhere on Earth. Lastly, you get Moon phase information that you can swipe through to go backward and forward in time. Starwalk for iPad puts the stars at your fingertips, literally. If you hold up your iPad, it shows you precisely what stars, constellations, and planets are in that part of the sky — whether or not you can see them with your naked eye. You can get detailed information on those stars, and you can drill farther away in the sky just by tapping, allowing you to get the goods on thousands of stars.